Since the launch of Apple’s ARKit, there’s been a ton of buzz and amazing demos shared, we recently shared a video on Twitter that showed WRLD working in ARKit. Given the interest we’ve received we decided to lay down steps for anyone who wants to get started with ARKit and WRLD SDK and see for themselves how amazing it is! Please check the requirements mentioned in the Unity-ARKit-Plugin for the software and hardware required for ARKit. To get started simply set the platform to iOS on your project and follow the steps below. The team at Unity has created a great plugin that allows us to utilize ARKit easily in any Unity projects. Currently it requires that you are using Unity version v5.6.1p1 or later. For detailed documentation please see the download page for the ARKit Plugin. 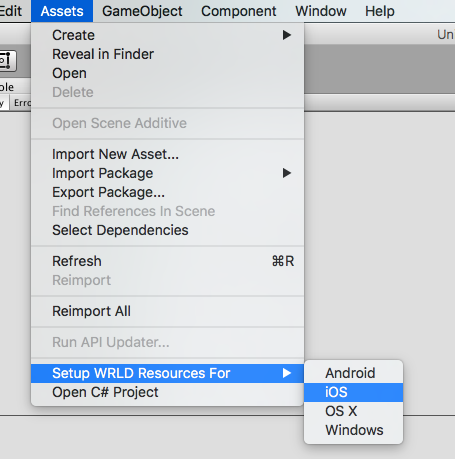 Download and import the WRLD Unity SDK. If you need a key and then click “Get Key” when prompted or simply click later if you already have one. 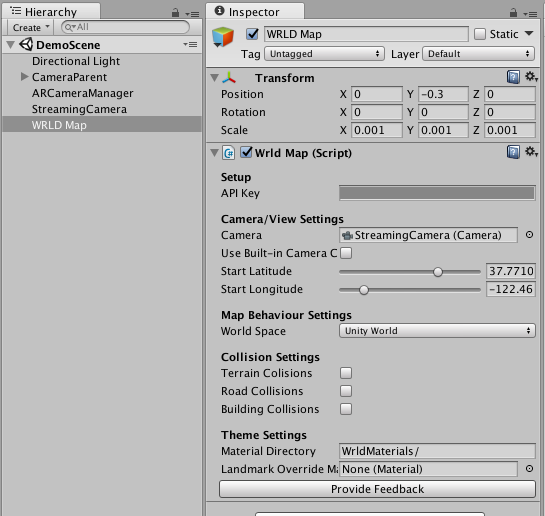 WRLD SDK is built to be used with real world scale such that 1 unit in Unity is considered 1 meters. You can read more about our coordinate system on our Unity documentation. ARKit however require objects to be quite small, so we will need to scale down our map. In order to do that we need to add a couple of lines of code in our SDK. We will add an API to enable this more seamlessly in future release. Create a new scene so we can set up ARKit and follow the steps below. 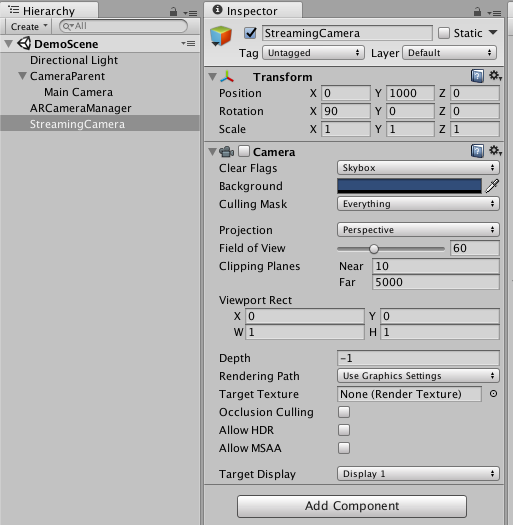 Create a new GameObject called CameraParent and make Main Camera its child. And that’s it!, ARKit is ready to be used. Now that we have ARKit ready, we can start setting up our map. Follow the instructions below. 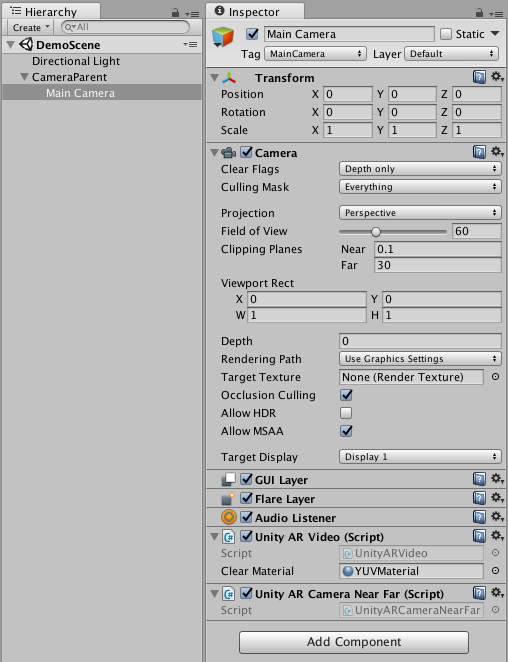 Setup iOS Assets through the Assets Menu. Create a new Camera and name it Streaming Camera. We will use this camera to stream our map. Disable the Camera component as we will not be using this to draw anything. Set Y position to 1000. This means we will be streaming from an altitude of 1000 Meters. Set X rotation to 90 so our StreamingCamera looks towards ground. Create a new GameObject and name it WRLD Map. We are now ready to view WRLD Map in ARKit. We have completed all the necessary steps, we can finally build our xcode project and see it running on an iOS Device. If you are having trouble with compiling libStreamAlpha.a then just set “Enable Bitcode” to No in Xcode Build Settings. Also make sure that you add Camera Usage Description for iOS in Player Settings->Other Settings. If you are having trouble getting shadows then you might need to go to quality settings and set the Shadow distance to 2 and Shadow Near Planes to 0.01. Now that you have a working project with WRLD in ARKit you can start to build new exciting things. Check out our next post that covers stencil masks and how to show a map on a surface within a certain area. We are excited to see what you build with WRLD so feel free to reach out and share with us @wrld3d, #madewithWRLD. If you have any questions, please reach out to us at support@wrld3d.com.